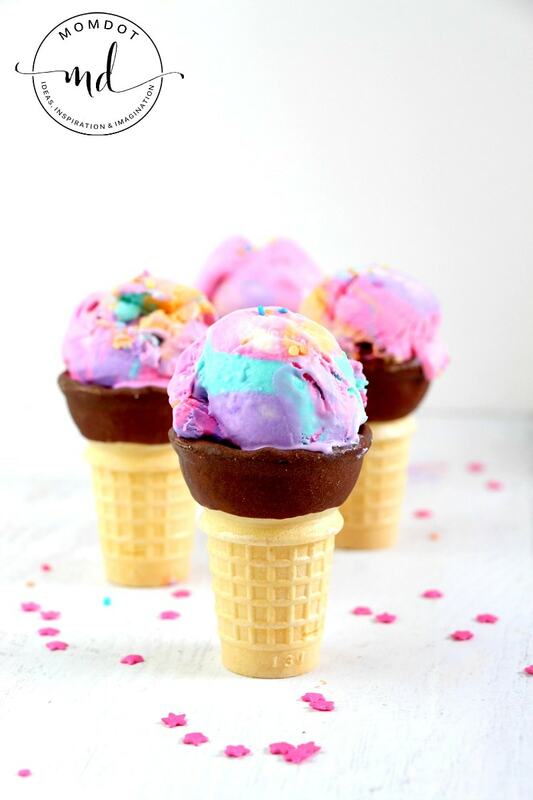 Homemade ice cream is so easy to make and with this no churn ice cream option for a gorgeous rainbow or unicorn colored cream, it’s even more fun! Learn how to make ice cream below in the easiest way possible and never have a late night craving without a perfectly creamy, delicious and colorful solution again. Homemade ice cream is so easy to make and with this no churn ice cream option for a gorgeous rainbow or unicorn colored cream, it's even more fun! Learn how to make ice cream below in the easiest way possible and never have a late night craving without a perfectly creamy, delicious and colorful solution again. Add in the sweetened condensed milk and stir until just combined. Divide the ice cream mixture into 4 bowls and add 4 drops of food coloring to each - pink to one bowl, orange to one, etc. Stir the food dye in until just combined, ensuring not to over mix. Spoon the ice cream mixtures in a random pattern into a loaf pan. You can layer if you like, but I like the pattern that came out of the random spots. Sprinkle on a bunch of unicorn sprinkles, and then run a butter knife through the loaf pan to swirl it all together.